I’m so excited to share this Argentinian alfajores dulce de leche sandwich cookies recipe with you! I’ve been dying to make a traditional Argentinian recipe ever since I got back from Buenos Aires. I finally got around to it when my friend from Buenos Aires recently visited and brought me so many goodies from his home. He brought me the best dulce de leche and so many other treats. But I knew I had to use the dulce de leche to make something that I’d had when I was in Argentina. 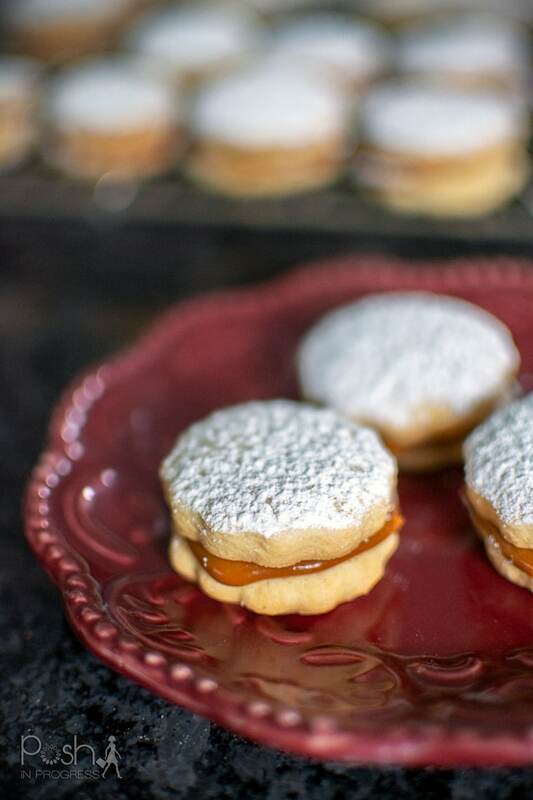 I decided to make these alfajores, which are dulce de leche sandwich cookies, because I love baking. Further, I wanted a challenge. I love making cut-out cookies, but I’ve honestly never really mastered them. They always spread and it drives me crazy! But this recipe was different. The cookies turned out perfectly. The interesting thing about alfajores is that they use corn starch in the dough, along with flour and sugar. I didn’t research it, but I think the corn starch must help with keeping the dough from spreading because they didn’t spread hardly at all. I got these super cute cookie cutters so I could make perfect rounds with little scalloped edges. Even if you think cut-out cookies are hard, I promise this recipe is a breeze. It probably took me 10 minutes to make the dough. After letting it rest in the fridge for an hour, it was a breeze to roll and cut out. I did use quite a bit of flour on my counter and rolling pin so the dough didn’t stick to the rolling pin, but it didn’t seem to affect the taste of the cookies at all. I only had to bake the cookies for 8-9 minutes. Ovens vary so much, just make sure they are the lightest golden brown. Once they are cooled, then the fun starts. I added about 1/2 tsp of dulce de leche to each cookie, topped it with a matching cookie and dusted them in powdered sugar. I opted not to put the traditional coconut around the edge because my family isn’t that into coconut. I’m so happy with how they turned out! The cookies are buttery and almost melt in your mouth. I actually wish I had added a bit more dulce de leche to give it a super strong taste, but I still loved them. I’m most excited about how well the dough turned out and that the cookies didn’t spread. I’m definitely planning to use that dough as a base for other sandwich cookies in the future. If you have some free time and love baking as much as I do, I highly suggest you try out this recipe. You can find dulce de leche at most grocery stores. If you have trouble with the consistency being too thin, you could try these tips out. Or you could also make your own dulce de leche – I think this recipe sound pretty great. It was a lot of fun making my first traditional Argentinian recipe. Next up, I need to find a recipe to use the membrillo my friend brought me. Stay tuned! 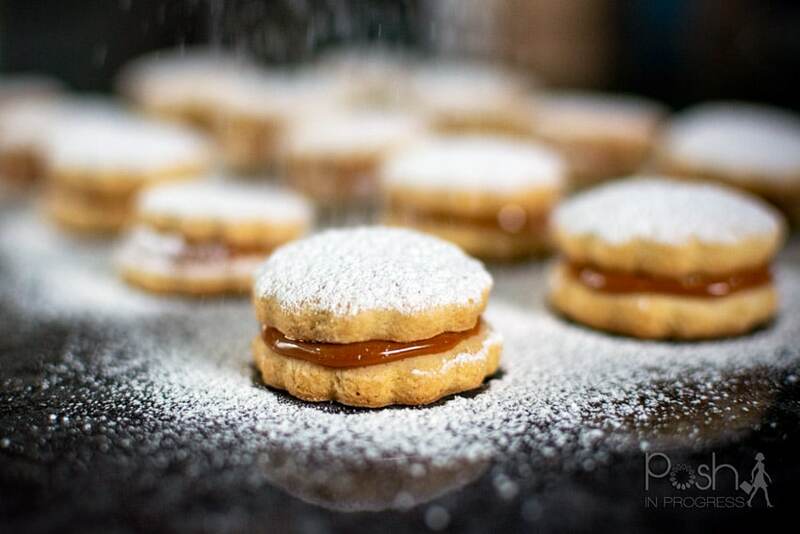 If you’d like to make your own dulce de leche sandwich cookies, this is the recipe i used. Enjoy these dulce de leche sandwich cookies!